Today, May 1st, is known and celebrated everywhere around the world as International Workers’ Day. Well, almost everywhere. In the United States, President Dwight D. Eisenhower officially declared May 1st to be “Law Day” in 1958. This was on advice of his legal counsel, in order to avoid the populist and (eek!) socialist stigma of Workers’ Day. Ironically, May 1st is commemorated as International Workers’ Day because of what happened in the streets of Chicago, Illinois, in 1886. It caught on. On May 1st of 1867, the workers of Chicago implemented a general strike which brought the city’s economy to standstill for an entire week. In 1872, the building trades workers of NYC struck until they won the eight hour day. 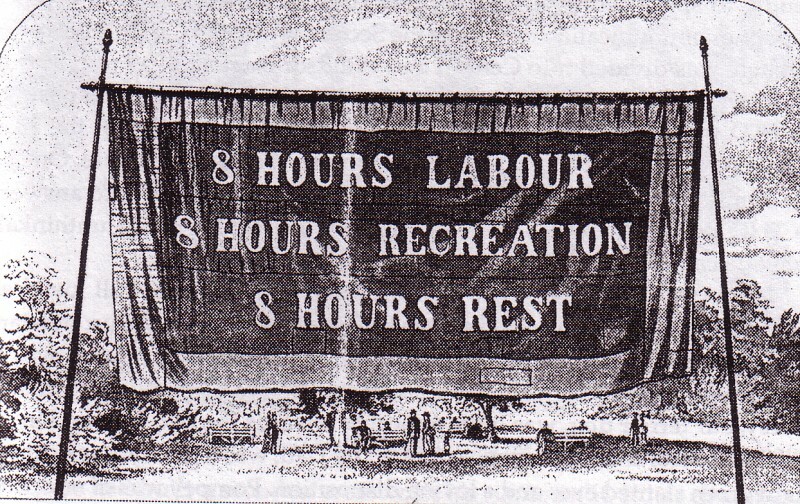 But despite national popular support, and a slew of toothless legislation aimed at pacifying the labor guilds, the 8 hour work day remained a dream for the majority of the population. 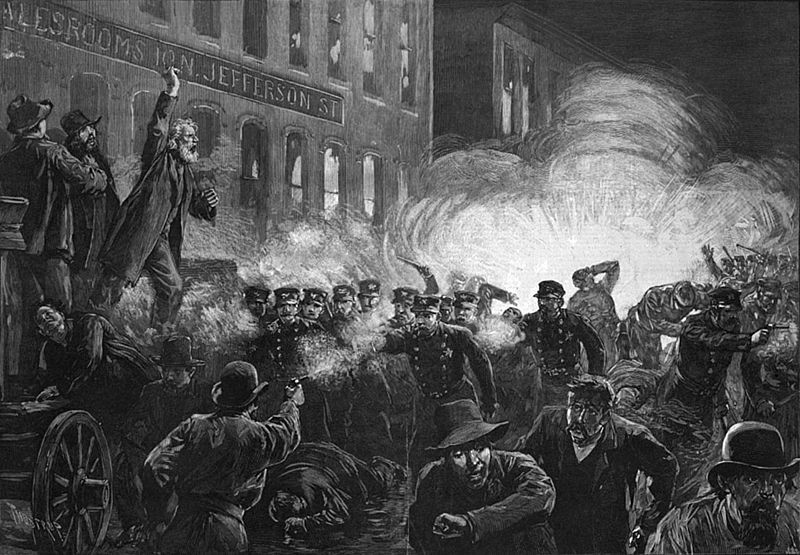 Three days later, on the 4th of May, a large assembly of workers and tradesmen met in Haymarket Square in Chicago to peacefully protest for the legal codification of the 8 hour day. The police were called to drive the protesters out. An unknown individual hurled a bomb at the police as they sought to deprive the workers of their Constitutionally guaranteed right to peaceful assembly. In response, the police opened fire indiscriminately on the crowd, resulting in the wounding of scores of protesters, along with the deaths of 4 civilians and 7 police officers (it’s not clear whether the police were killed in the bomb blast or were caught in the crossfire of the shooting that followed). This became known as the Haymarket massacre. Numerous leaders of the labor movement were subsequently rounded up and arrested, and despite the court’s affirmation that not one of them had actually thrown the bomb, seven men were sentenced to death. Two sentences were commuted by the Governor, and one man committed suicide in prison. The remaining four were hanged November 11th, 1887. The subsequent strikes around the country resulted, over the next 20 years, in an 8-hour workday for the majority of unionized trade workers. May 1st, 1886, is still looked upon as the date on which the movement truly found its feet, and the repercussions of the May 1st Chicago resolution gave the movement its first martyrs. International Workers’ Day commemorates their fight. Before the minimum wage was introduced during the Great Depression of the 1930s, there was no national minimum wage, or indeed any legislation to protect workers from exploitation. Because of this lack of regulation tens of thousands of workers were routinely exploited in sweatshops and factories, forced to work in horrible conditions and for pennies a week. Early attempts by labor unions to create a mandatory minimum wage were ruled unconstitutional by the U.S. Supreme Court on the grounds that they “restricted the worker’s right to set the price for his own labor”. This allowed employers to continue exploiting their workers through the Great Depression of the 1930s, when incredible demand for jobs caused wages to drop even further to an all-time low. Under the Fair Labor Standards Act, employees were legally guaranteed a fair wage for an honest day’s work for the first time in the history of the United States. The important lesson to take away from both of the above stories is that our rights, even the most seemingly basic of them, were not given to us freely from above. We had to take them. Whether it was through protests, strikes, legal battles or even street brawls, our grandparents and great grandparents had to forcefully wrest control of their own destinies from the hands of the bankers and the industrial monopolies of the time. As America continues its backward slide into 1920s-style corporatism, with more and more of our rights and civil liberties being stripped away in order to appease the wealthy and the powerful, now more than ever we need to bear in mind the incredible power we command when we stand united against the tyranny of moneyed interests and political corruption. Something to think about, this May Day.